The Titan Plus is a very durable steel trench box that is built to versatile and lightweight. They are ideal for mainline work while using a smaller or lighter excavator. The Titan Plus trench box is quite capable of handling a number of different applications which include manholes, spot repairs and mainline work. It is an all-steel designed trench box as well as solid-welded. 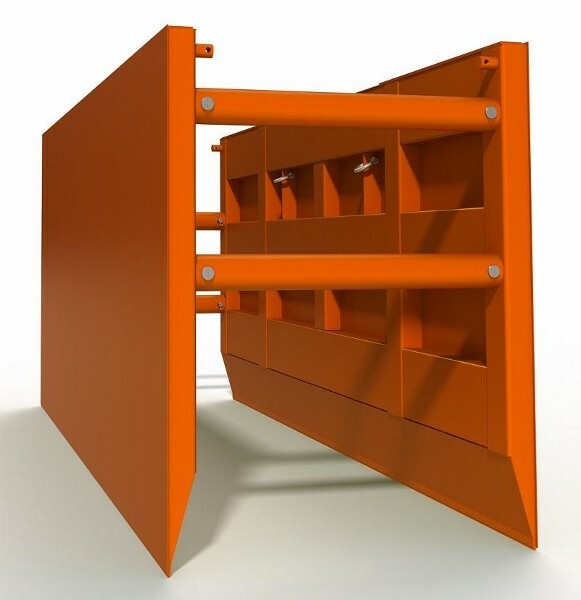 This trench box is built for use in light trench safety work. The Titian Plus differs from the Titan Lite trench box in that it is able to reach production depths of 16 feet to 30 feet. The Titan Plus trench box just like the Titan Lite also has a width range of 4 feet to 10 feet. What makes Kundel Titan Plus Series of Trench Boxes better than the competition? The Titan Plus Trench Box is unique as it features continuous welds. This is superior to the competition which uses a stitch welding technique. Each the trench box is built with an internal shelving system. This system is a feature that is unique to Kundel. The Plus trench boxes are not filled with wood and foam that can rot and retain water. In addition, they place thick steel pounding pads directly on top of continuous steel vertical end tubes. The production depth of this trench box line is 16 feet to 30 feet. There is no wood filler at the top. When you tamp the box into the ground the force is transferred straight to the bottom cutting edge. The Kundel Titan Plus Trench Boxes are designed to rack as you pound one side at a time. Each corner moves independently. This design allows for more efficient installation and removal of the trench box at the completion of the project.